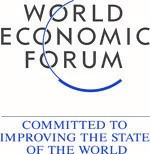 "An initiative of the World Economic Forum"
Of the 7 billion people in the world today, over 870 million are chronically hungry and undernourished. Food production is already constrained by shortages of land and water, inadequate infrastructure, lack of access to inputs and credit, an increasingly volatile climate, and extreme fluctuations in the prices of food and other commodities. By 2050, the world’s population will have risen to 9 billion. Feeding this population sustainably will require substantial changes to ensure the production, distribution and consumption of sufficient nutritious and sustainably produced food. The New Vision for Agriculture has developed a model for country- level partnerships based on working with key stakeholders to identify common goals, define shared priorities, and develop and execute action plans. This approach started in 2010 with Tanzania and Vietnam, and was then replicated in Mexico, Indonesia and the Indian state of Maharashtra. Inspired by these examples, six additional African countries committed to take action: Burkina Faso, Ethiopia, Ghana, Kenya, Mozambique and Rwanda. PISAgro was announced during the World Economic Forum (WEF) in East Asia, which was held in Jakarta in June, 2011 by Bayu Krisnamurthi, Vice Minister of Agriculture and Mahendra Siregar Vice Minister of Trade. 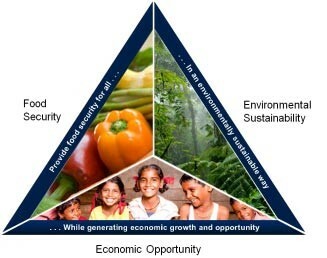 To bring the New Vision of Agriculture of the WEF into real action and to accelerate the changes that are needed to tackle the food security issue, the initiative by the Indonesian Government was quickly supported by seven private companies: Bayer Cropscience, Indofood, McKinsey, Nestlé Indonesia, Sinar Mas, Syngenta and Unilever to form a Public Private Partnership platform. The seven companies are known as the founder of PISAgro. PISAgro was aspired to provide platform for collaboration among the different stakeholders in Indonesian agriculture sector. It was set up to facilitate dialogue, mobilizes commitments and new partnerships that connect the strengths of each stakeholders. Its objective is to achieve a target of 20% increase in agricultural productivity, 20% increase in farmers’ income and 20% decrease in greenhouse gas emissions in each decade. Subsequently, PISAgro was formally established and legalized by a public notary with the Indonesian name “Kemitraan Pertanian Berkelanjutan Indonesia” on April 20, 2012. 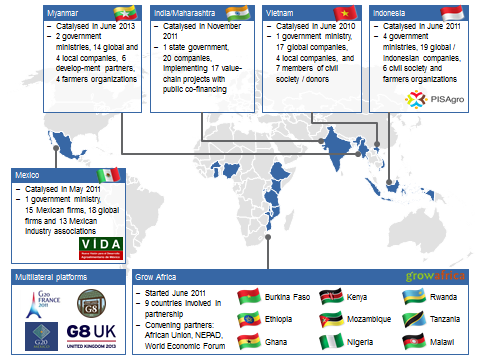 The PISAgro Secretariat was set up as a coordinating body to support the partnership activities, which include a leadership level operating committee and commodity-based working groups. It also facilitates the alignment of the stakeholders, including global and Indonesian companies, international agencies, civil societies, farmers’ organizations, and government ministries. The secretariat is also responsible for engaging new stakeholders and handling communications and media activities. In addition, it coordinates with the global platform of the New Vision for Agriculture initiative, leveraging its global and regional networks and expertise to achieve impact in Indonesia. 2016 © pisagro.org - All Rights Reserved.